bang, that's the note the exhaust throws up on the overdraft. It spits and burbles, and it is at its sweetest when you activate the baffles that raise the decibel level on that exhaust note. 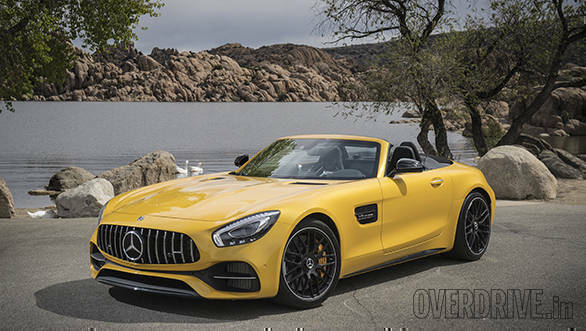 Or I could simply start off this review with the legacy of the AMG GT and how Mercedes-AMG have now given their sports car brand a fourth and fifth dimension as a Roadster, with the GT and GTC trim. Obviously the former sounds like more fun, no? But here's the thing, the car is a Grand Tourer and keeping with the spirit of being a roadster you keep the top down and cruise, and that sort of motoring suits a country like the USA. That however also means things are not going to get very fast simply because in this land there are innumerably more straights than there are twisties, majorly restricted speed, so dynamic and visceral are probably two things you won't hear in my story. In fact at points on our drive, especially the bits involving the interstate, things got so downright boring, we yawned and then some more. In a GT that sounds absurd but the expanse of North America in hindsight simply isn't the backdrop for a car like this, Europe would have been much better. The AMG GT Roadster however couldn't care less about what the backdrop is, it has an aura about it that just couldn't care! It's the poster boy for the bad boys club, the muscle car rep from across the Atlantic to stand up against the Americans. The GT Roadster does not appear to be aggressive in its images, but in the flesh to see it come around a corner, it's a beast. The GT Roadster's stance is low slung, its slightly longer width compared to the base GT and the low ground clearance give it an immensely well planted footprint. The Mercedes-AMG GT Roadster appears to cling to the road at all times and it is in my mind its most appealing visual recall. That visual combined with the new grille with the vertical slats that Mercedes-AMG calls the 'Panamericana grille', the wide headlamps with the stack of daytime LEDS, the large air vents that direct air to the radiators placed behind them, these are all elements that come together to enhance the GT Roadster's appeal. It's a fantastic looking car, combining the elegance Mercedes-Benz is known for with AMG's blunt bludgeon appeal! At its heart is also the lightweight three layer fabric soft top which opens and shuts in just 11 seconds up to speeds of 50kmph. For India if you intend leaving the top down, just remember to configure the car with a darker trim! The design has changed mildly compared to the older AMG GT, the dimensions for most parts are the same except the AMG GT C borrows heavily from the AMG GT R, so track width has increased by 57mm thanks to a wider set of tyres being used and therefore the rear width has also increased by resculpting the fender area. 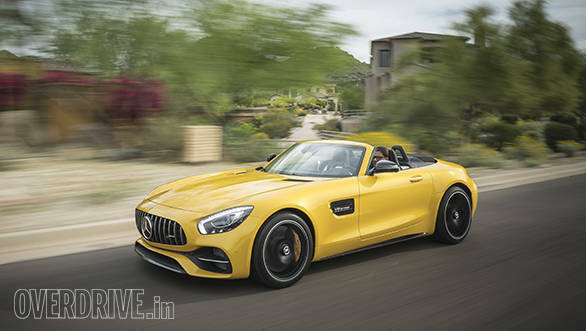 The AMG GT Roadster by the way is the starting point for the series, the AMG GT C Roadster is positioned between the AMG GT S and the GT R in performance rankings. The GT C however isn't coming to India. 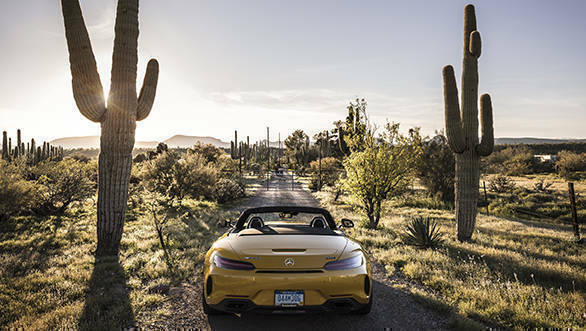 Within the cabin, things continue to remain more or less the same as the older AMG GT, though new features like the Airscarf system find place in the roadster. It's a pretty cool feature for European and North American regions where the air can get pretty cold driving with the top down. The Airscarf comes in handy at this time by blowing a stream of warm air at the back of your neck keeping motoring with the top down comfortable. The AMG GT Roadster continues with the 4.0-litre bi-turbo direct injection V8 engine with a peak power output of 476 horses at 6,000rpm. Max torque is a stiff 630Nm coming in at just 1,700rpm and staying flat until 5,000rpm! 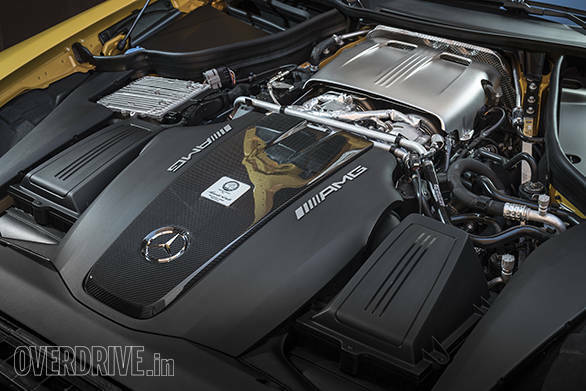 That gives it some fantastic drivability though Mercedes channels this power through its AMG Speedshift DCT (dual clutch) 7-speed transmission and not its more contemporary 9-speed transmission. In the AMG GT C, the same engine is kneaded to deliver 81 more horses with 50Nm more torque reaching a peak 680Nm. It's a fabulous engine with quick responses and with enormous gut wrenching power. And it sounds like a proper GT too, the exhaust rumble wafting through in waves, engulfing the occupants with its delicious notes. The drivability is impressive even though it's an automatic, The torque spread is wide but also comes in smoothly and stays there for long. So even in top gear, gentle nudges to the throttle get instant reactions. 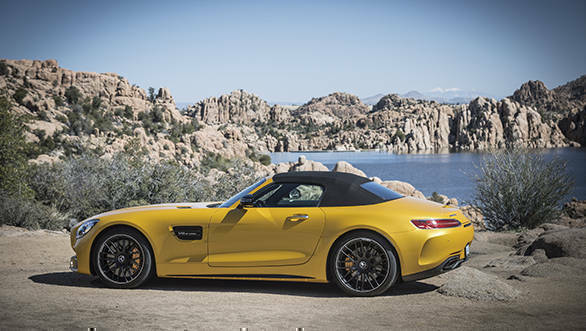 As sports cars go, the AMG GT and GTC Roadsters are pretty quick too, the former getting past 100 in 4 seconds while the latter turning out to be 4-tenths of a second quicker. Top speed for the GT Roadster is clocked at 302kmph while the GT C goes a bit further to 312kmph! 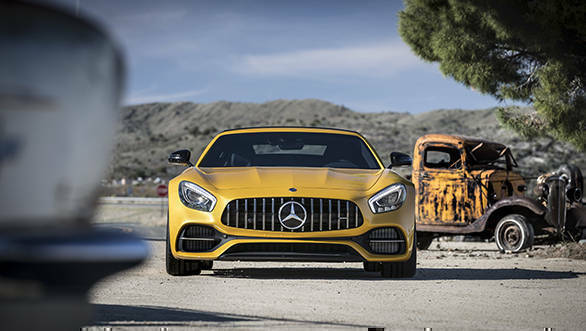 The principal mechanical changes come by way of the new driveline configuration, though this is largely reserved for the AMG GT C. These changes can be optionally configured on the AMG GT as well. First there is the Active Rear steering that is also borrowed from the AMG GT R. With this, the rear wheels steer either in the same direction as the front wheels or in the opposite direction. This depends on the speeds of the car. Under 100kmph, the rear wheels steer in the opposite direction to the front wheels thus improving its agility. In urban areas, the turning radius gets tighter and maneuverability especially while parking gets easier. At speeds over 100kmph, the rear wheels steer in the same direction as the front wheels adding even more stability and control to complement its agility. Technically the lateral forces build up faster at the rear wheels and thus it also speeds up the steering responses. In a few of the tighter sections around Sedona, the AMG GT C was a blast, the rapid direction changes and the precision and agility with which it makes these turns is impressive. I only wish we had the opportunity to drive these cars at a proving ground and get a better sense of what the steering system is capable of. The new rear axle steering system is an option that can be opted for on any of the GT range. As explained by some of the tech team members, the axle stays the same at the rear, so the length does not change and it's only a slave unit for the steering that is introduced. Also the wheel wells have enough space in them already to accommodate the wheel movement so overall the job of introducing rear wheel steer was not too hard for the engineers. The wider track on the rear of the GT C comes from the wider rear tyres, the 305/30 R20 lengthening the track by nearly 57mm compared to the standard GT which has a 265/35 R19 section rear. Another important change is the rear axle differential lock that is now offered as a standard across the range. The AMG GT C Roadster offers an electronically controlled rear axle differential lock integrated into the transmission housing. It is supposed to improve traction especially in corners, so you have higher cornering and exit speeds and it also brings more stability under braking. And lastly the braking system uses high-performance composite brakes with larger discs and more efficient 6-pot fixed calipers. You can also opt for the 40 per cent lighter and more efficient with greater braking strength carbon ceramic brakes. Overall the GT Roadster is fun, it definitely has its moments but there are also some bits that seem to be old school. 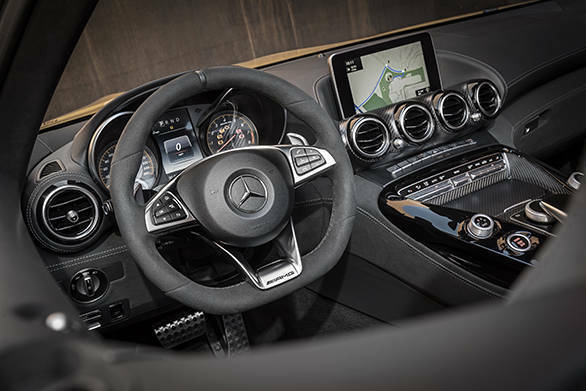 The new navigation system for instance, that you get on the newer generation of Mercedes Benz passenger cars isn't yet incorporated in the GT Roadster. The ride quality can be hard on some broken roads, and yet is incredibly comfortable if left in comfort driving mode. There isn't a head up display as standard, though when the car comes down to India I assume it will be offered as an option. 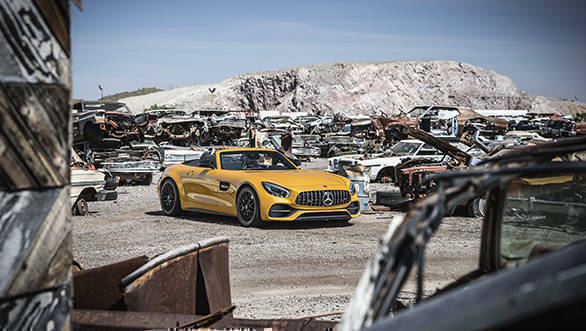 Yet the thrill of the AMG GT Roadster is in driving it, everything else is simply ornamentation, there to lift an already great car to an extraordinary level!